Contributors. About the Authors. Preface. Acknowledgments. C.R. Wolfe, Learning and Teaching on the World Wide Web. V.F. Reyna, C.J. Brainerd, J. Effken, R. Bootzin, and F.J. Lloyd, The Psychology of Human-Computer Mismatches. M.D. Anderson, Individual Characteristics and Web-Based Courses. M.A. Britt and G.L. Gabrys, Teaching Advanced Literacy Skills for the World Wide Web. C.R. Wolfe, Creating Informal Learning Environments on the World Wide Web. L.W. Sherman, Cooperative Learning and Computer-Supported Intentional Learning Experiences. G. Riva, From Real to Virtual Communities: Cognition, Knowledge, and Interaction in the World Wide Web. N. Hammond and A. Trapp, How Can the Web Support the Learning of Psychology? C.H. Jazwinski, Gender Identities on the World Wide Web. J. Morahan-Martin, Caught in the Web: Research and Criticism of Internet Abuse with Application to College Students. A.N. Joinson and T. Buchanan, Doing Educational Research on the Internet. J. Wiley and J.W. Schooler, The Mental Web: Pedagogical and Cognitive Implications of the Net. Author Index. Subject Index. 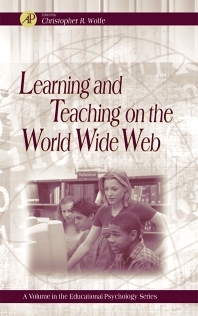 This book is about using the Internet as a teaching tool. It starts with the psychology of the learner and looks at how best to fit technology to the student, rather than the other way around. The authors include leading authorities in many areas of psychology, and the book takes a broad look at learners as people. Thus, it includes a wide range of materials from how the eye "reads" moving graphs on a Web page to how people who have never met face-to-face can interact on the Internet and create "communities" of learners. The book considers many Internet technologies, but focuses on the World Wide Web and new "hybrid" technologies that integrate the Web with other communications technologies. This book is essential to researchers is psychology and education who are interested in learning. It is also used in college and graduate courses in departments of psychology and educational psychology. Teachers and trainers at any level who are using technology in their teaching (or thinking about it) find this book very useful. Researchers in education, social and cognitive psychology. Christopher R. Wolfe is director of Quantitative Researching and Instructional Computing at Miami University. He is also an officer of the Society for Computers in Psychology and founding editor of the Dragonfly Web Pages, an award winning Web site for science and children.